Families can just as easily take Classroom Character out of the classroom and into their homes. Your family can work together using our own Google Classroom account, which we use as the framework for our school programs . Each month, we build four interactive character education lessons that include short video clips, virtual field trips, and a high-interest article that are available for immediate access on your home computer or mobile device. These lessons are built on the KIND principles. Every week, we share videos, articles, and websites to help those inspired to learn more. 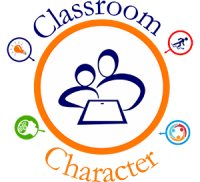 Sign up today and receive a sample of one month’s curriculum from Classroom Character! "Character education is just as important as reading, math and science."